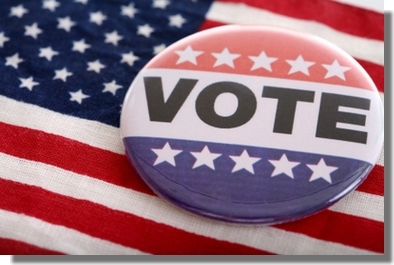 Trying to get out from under the din of the presidential nominating contests is difficult but there are some pretty important elections in Hampton Roads next Tuesday, June 14. In addition to Congressional primaries, there is a Peninsula State Senate district contest. Voters will cast their ballots at their regular polling locations. Due to changes in Congressional district lines, check what’s on your ballot to see which of these elections affects you. 2nd Congressional District: Republican primary. Unless you’ve shut off your TV for the past few months, you know there is an election in the 2nd. The current representative, Scott Rigell, is not seeking re-election. The re-alignment of the districts has current 4th district representative Randy Forbes seeking the open seat in the 2nd. State delegate Scott Taylor and attorney Pat Cardwell round out the field. The court-ordered redistricting makes the 2nd slightly more Republican, which seems to have scared off nearly all Democratic challengers. The winner of this primary will face Democrat Shaun Brown in November. Unless something changes rather quickly, Brown faces a daunting task. Although I live in the district, I’ve not received any contact from Forbes or Cardwell. Of course I’ve seen Forbes’ ads on TV and have heard about his mail. I have gotten regular emails from Taylor, having been on his email list for several years now, going back to his run for this seat the last time it was open. 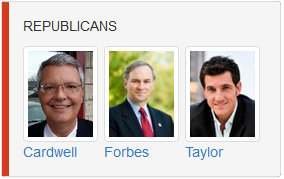 Although there are three candidates, the race is between Forbes and Taylor. I have my concerns about Taylor but at least he appears to be more reasonable – a point The Virginian-Pilot made in its endorsement of him – and he lives in the district. I expect this race to be very close. Forbes has received the endorsement of a number of Virginia Beach Republicans, as well as state and federal officials. Meanwhile, Taylor has the support of the Stolle machine (including my state representative) in Virginia Beach. Since Virginians don’t register by party, the primary is open to all registered voters in the district. 4th Congressional District: Republican and Democratic primaries. Voters in the 4th will have to request either a Republican or Democratic ballot, because there are nominating contests for both parties. Due to the same redistricting mentioned earlier, the 4th is now more Democratic-leaning than before (which is what prompted current representative Forbes to bolt to the 2nd). Gonzalez is a 40-year-old native of Kenya with a degree in environmental planning and management. She moved to the U.S. several years ago and became a naturalized citizen after meeting her husband during a vacation trip here. She had been working in a United Nations refugee camp in Kenya at the time. Most recently, she had been a coordinator for the Richmond-based Family Foundation of Virginia, a conservative advocacy group, but left that post to run for Congress. Wade, 60, was first elected sheriff in 1999. He said he was motivated to run for Congress because of his frustration with top-down federal regulations that are ineffective in dealing with substance abuse and mental health. As sheriff, he established a jail substance abuse program that has grown to 300 beds – the largest in Virginia. 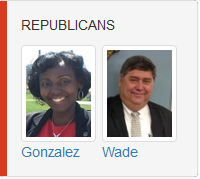 The Pilot endorsed Wade. Given his current status as an elected official (plus the Gonzalez has raised little money), I suspect Wade will win this nomination. 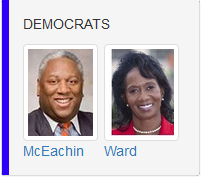 Democrats will choose between state senator Donald McEachin and Chesapeake City Council member Ella Ward, the latter of which is actually the only candidate running in the 4th that lives there. Those of us who have been involved in Democratic politics for any length of time know both of these candidates pretty well. I’ve been surprised that McEachin hasn’t gone up on TV here, especially since Ward has managed to do so, despite lagging in fundraising. McEachin garnered the endorsement of The Pilot. I suspect turnout in the Richmond area will swamp that of Chesapeake. (My guess is a lot of folks are going to show up in Chesapeake but will be surprised that Forbes isn’t on the ballot.) Given that, I anticipate McEachin will be the winner. 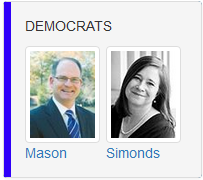 On the ballot are Delegate Monty Mason and Newport News School Board member Shelly Simonds. Mason has represented the 93rd House District since his election in 2013. Simonds, who ran unsuccessfully for the neighboring 94th district in 2015, was elected to the school board in 2012. As of the last financial reporting period, neither candidate was raising a lot of money, although, as this article notes, the sources of their funds is interesting. Mason got a head start in this race because Simonds was running for re-election to her school board seat, an election that she won on May 3. (I received her announcement for Senate the next morning.) There has been little coverage in the newspaper and I’ve not seen TV ads for either candidate, so I don’t have a sense of the race.